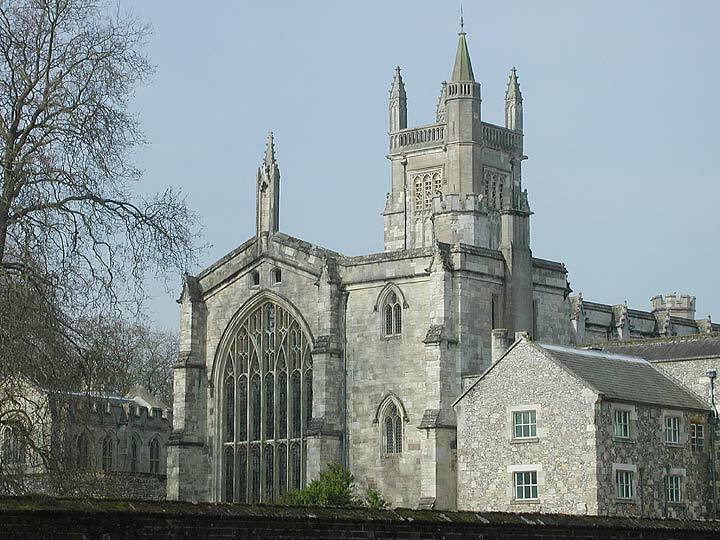 These pages on the architecture of Winchester College consist of 84 photographs plus notes (in italics) from Hampshire and the Isle of Wight by Nikolaus Pevsner and David Lloyd (1967) Yale University Press, New Haven and London. Winchester College was founded in 1382 by William of Wykeham, Bishop of Winchester. 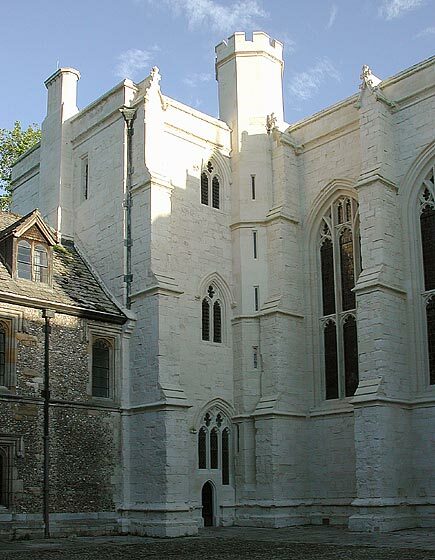 William of Wykeham .. was the first to have a coherent idea of a system of tuition rising from school to college, and his two foundations, New College Oxford and Winchester College, were on a scale unprecedented in England and - as far as Winchester, i.e. 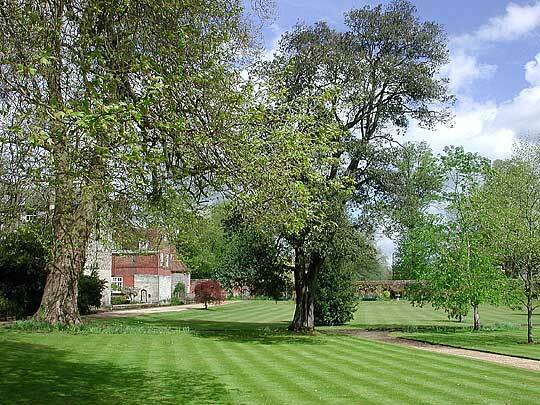 the school, is concerned - abroad also. 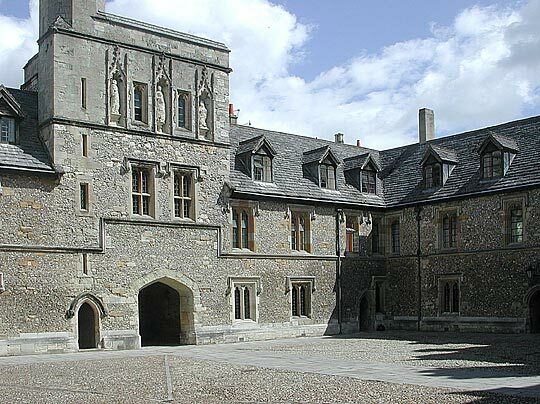 The late C14 parts of Winchester College consist of the Outer Court with its gatehouse, the Chamber Court with its gatehouse and with Chapel and Hall at the far end, and the Cloister or Cemetery beyond. All this was complete when William died in 1404. 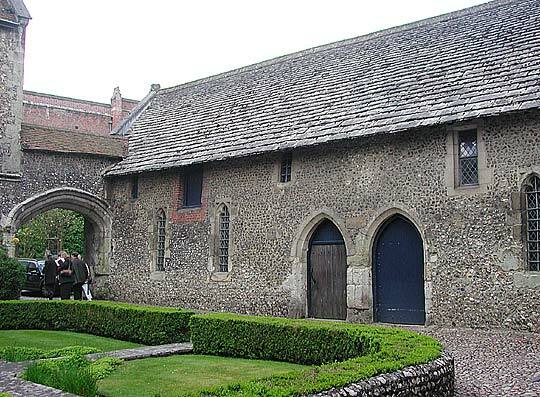 Additions were made in the C15, and many have of course been made since. 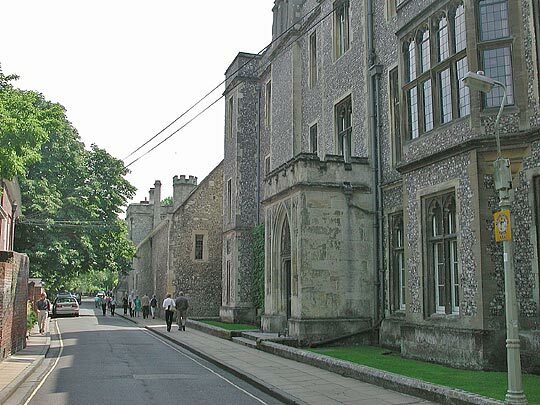 We take the buildings topographically, starting in College Street. 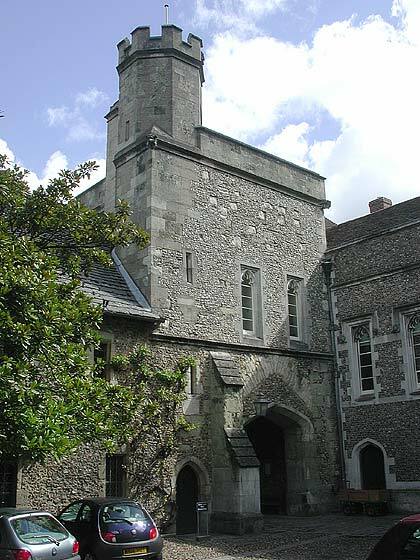 Outer Court is entered by the gatehouse which, on this side, has a higher stair-turret. 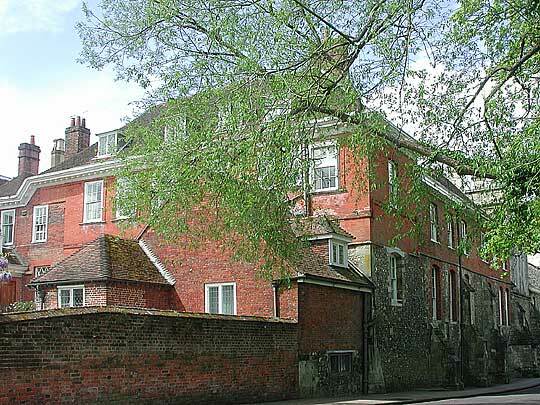 The E side is a re-fronting of the Wardens' Lodgings by G.S. 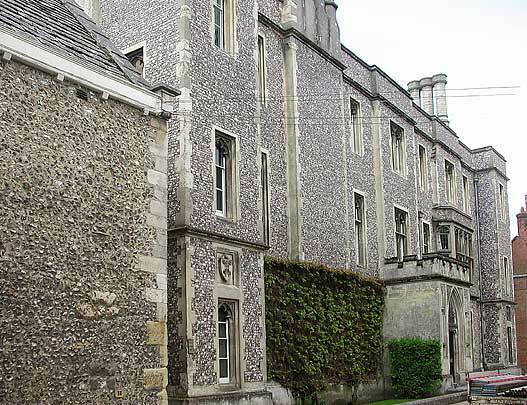 Repton, 1832-3, and again coursed, knapped flint and windows like the headmaster's. ... The S range is the most interesting. 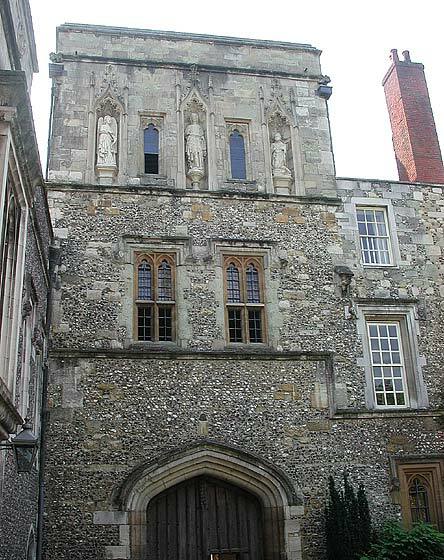 Three-storeyed Middle Gate, the arch like that of the outer gatehouse. First-floor windows of two lights with a transom. 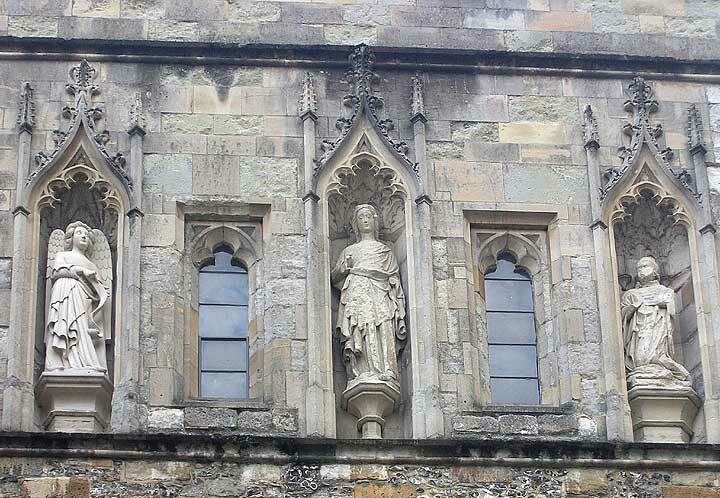 Then three niches ... the Virgin and William of Wykeham (and the Angel of the Annunciation on the left). 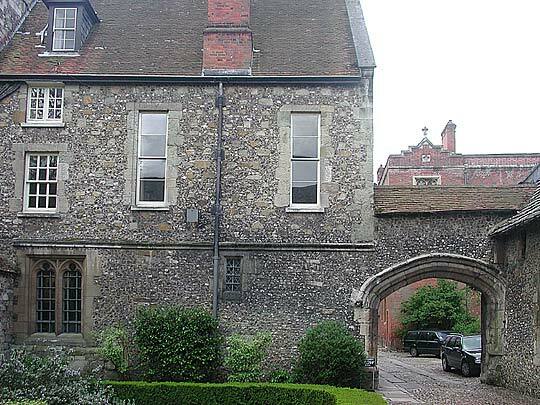 To the W is a screen (the archway is dated 1663 - on right in first picture), but originally Outer Court went on. 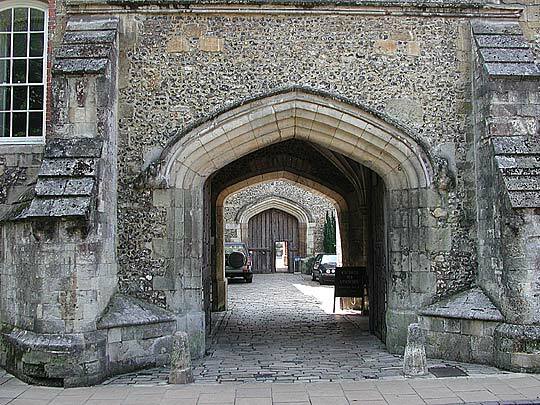 Simple doorways of one hollow chamfer to the N and W, where brewhouse, slaughter house, and stables were located. 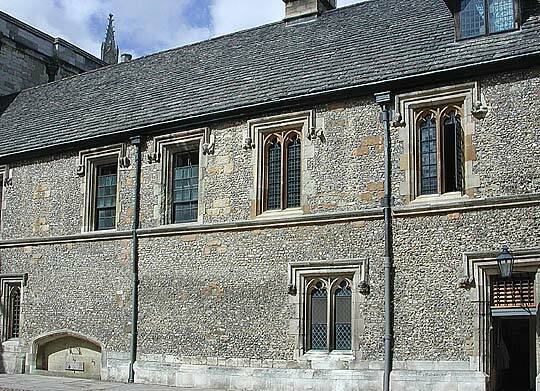 Most of the windows oblong, single-light, and barred, but in the W range one original larger window with a cusped head. 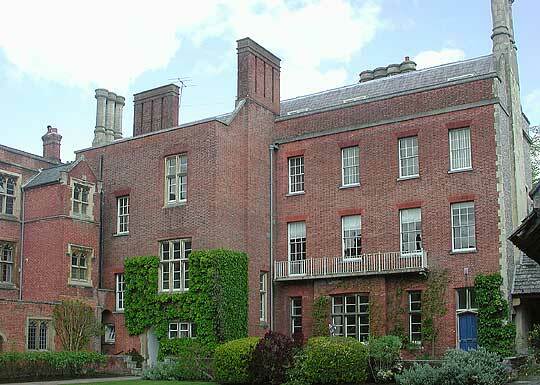 The brewhouse was converted internally into the Moberly Library by Sir Herbert Baker, 1932-4. Interior of the Moberly Library. 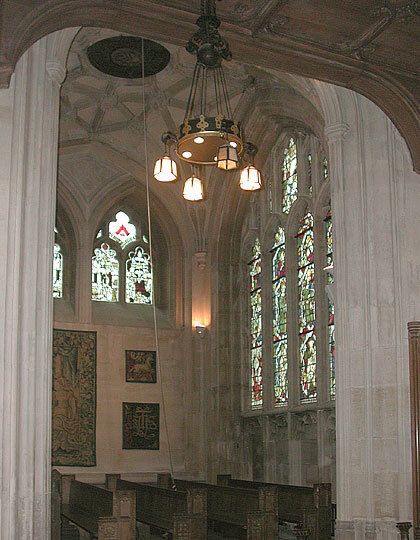 The Empire Clock on the wall was presented and installed by Sir Herbert Baker in 1936. 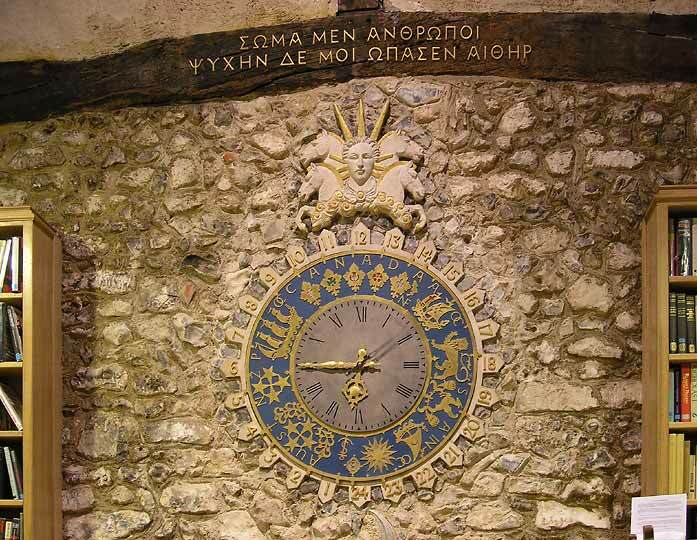 The Greek epigram reads: Men gave me my body, ether my soul. 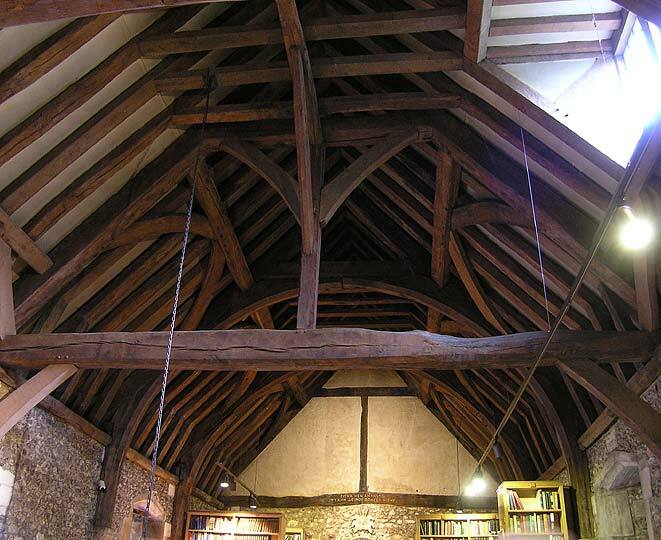 Fine cusped lierne-vault (of wood) in appearance close to a fan-vault. Very thin ribs. 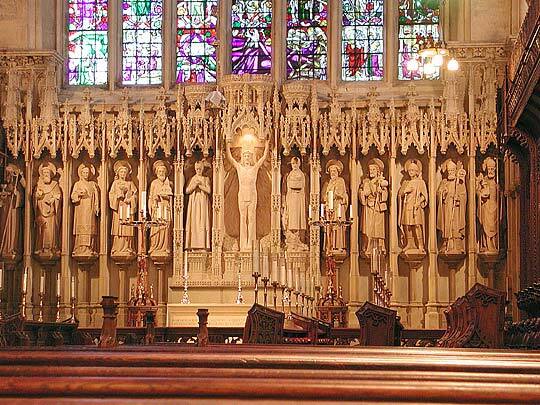 ... Reredos. 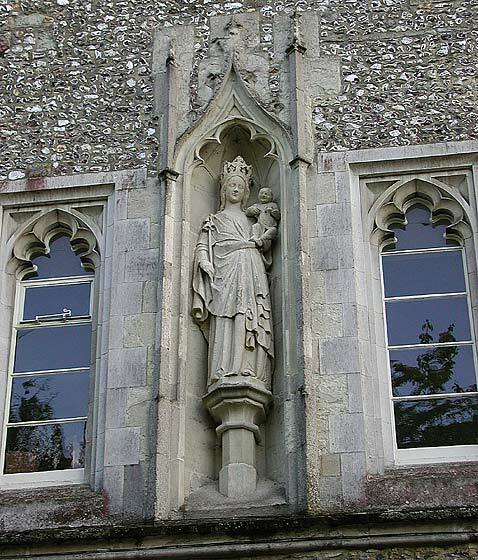 Of stone, c.1470, scrupulously restored by Butterfield, 1874-5. 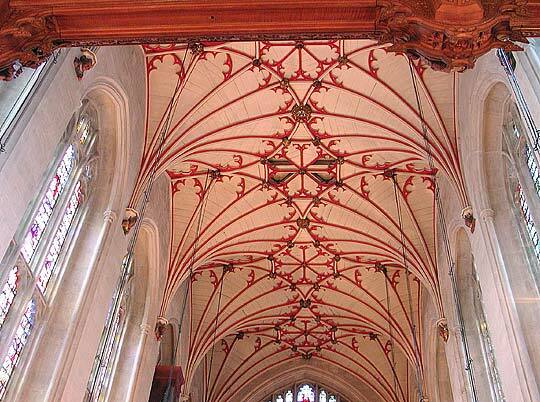 It has fifteen niches all of crocketed canopies. The middle three (altered by Caröe in 1920) are higher than the others and have a top cresting. 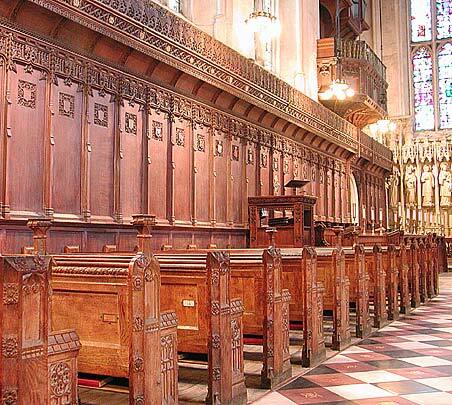 ... Panelling, stall and pews. By Caröe, 1913-21. 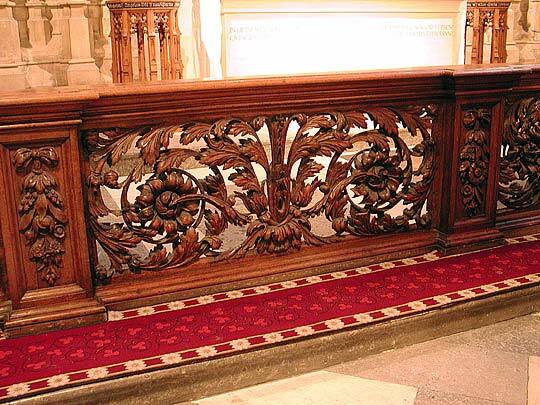 ... Communion rail. Of openwork foliage. 1680-3. 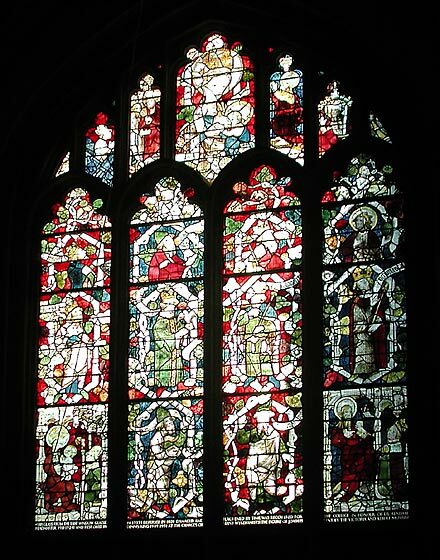 By Edward Pierce ... Stained Glass. 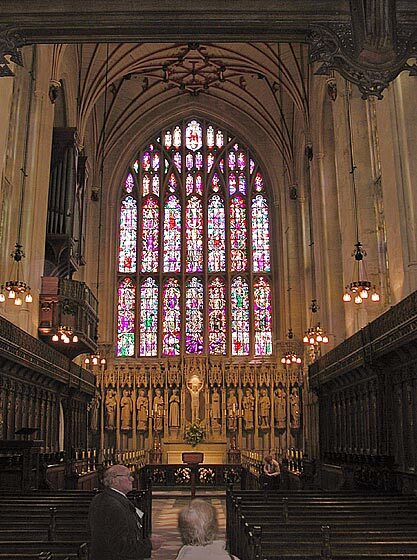 The famous Jesse Window was datable to 1393, but what is there now is all by Betton and Evans of the years 1822-3. The original glass disappeared ... but a good deal is now in Thurbern's Chantry (see below). 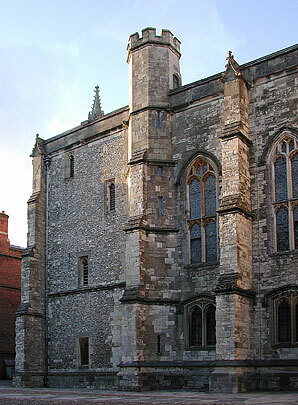 The tower is the most prominent beacon of Winchester. .. 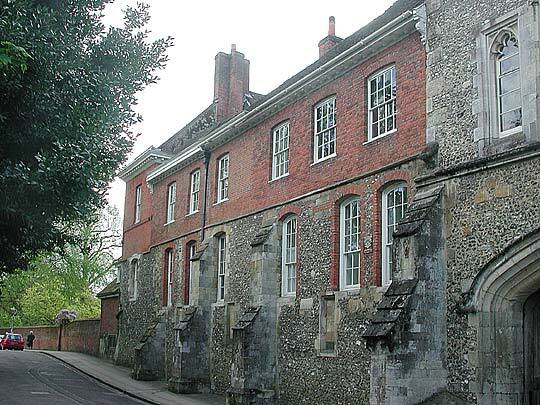 In 1862-3 it had to be pulled down completely and rebuilt (by Butterfield). .. It is of four stages with the bell-stage blank-panelled around the quite small bell-openings. 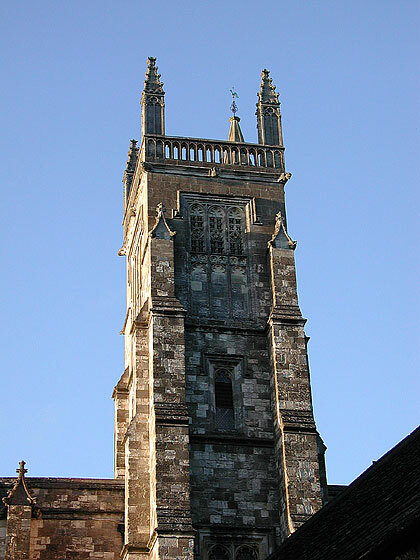 Tall square pinnacles and yet higher stair-turret. 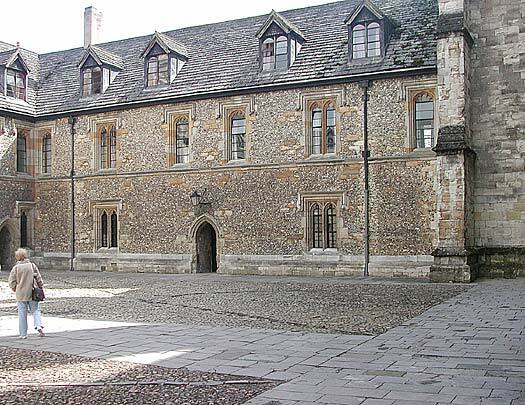 The Hall is W of chapel on the upper floor ... Below it is the original school-room. It is now called Seventh Chamber. 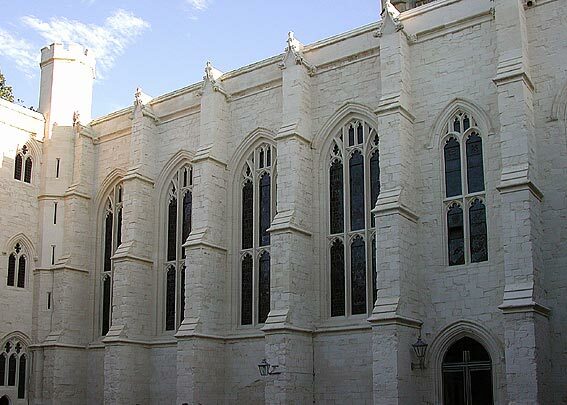 It has small two-light windows. 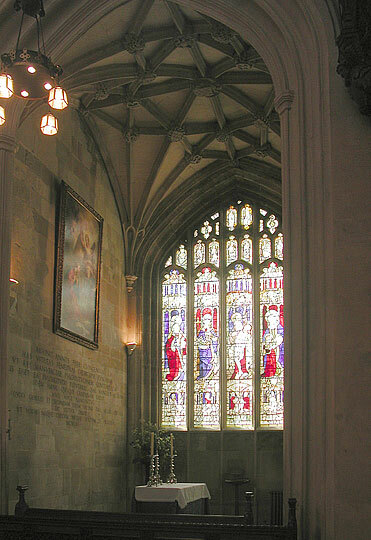 ...Hall has large two-light windows with a transom ... 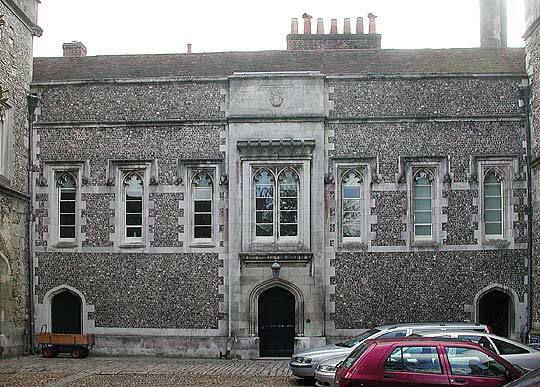 The panelling was made in 1540. 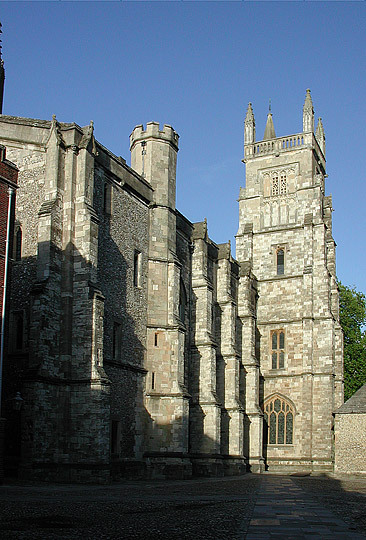 The Cloister adjoins the tower almost immediately. ... It has completely bare walls to the outside, and as one enters it, one is reminded of Italy by its seclusion and the wagon roofs. 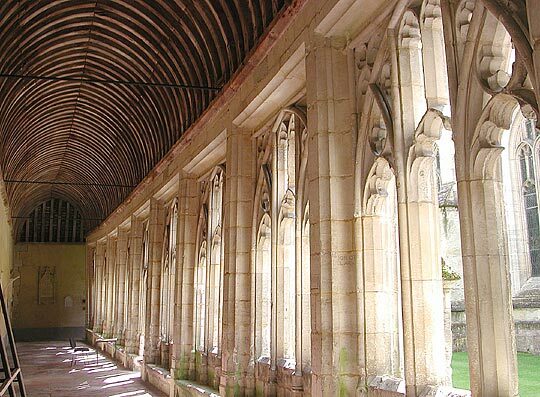 The openings to what was the garth are of three lights under two-centred arches. Some panel tracery. ... 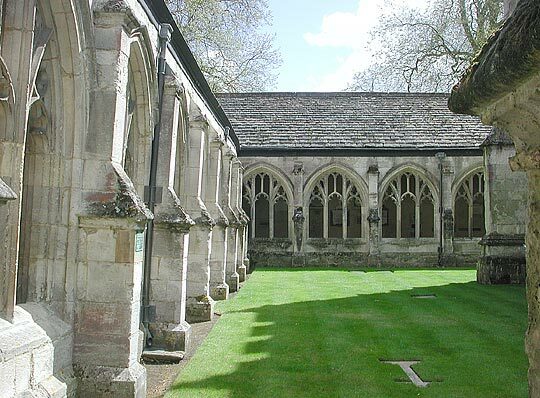 In the middle of the Cloister lies the Fromond Chantry Chapel (last picture). 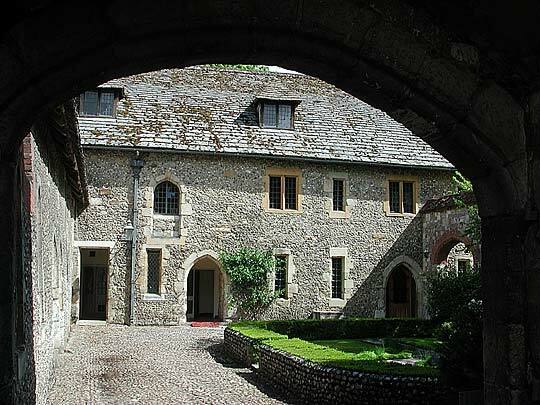 Fromond's bequest dates from 1420. ... 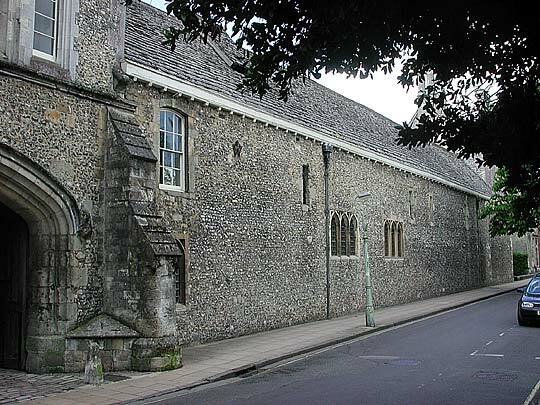 The chapel proper is on the ground floor, above and much lower was (and is) a library. ... All windows have head-stops. ... 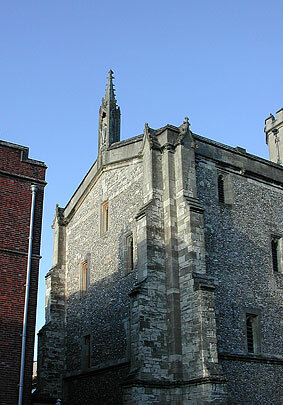 In the SW corner is the stair-turret.